Science for the Savvy Space Traveler! Imagine taking a hike along the windswept red plains of Mars to dig for signs of life, or touring one of Jupiter's sixty-four moons where you can photograph its swirling storms. For a shorter trip on a tight budget, the Moon is quite majestic and very quiet if you can make it during the off-season. 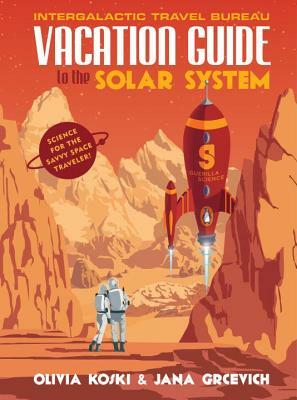 Packed with full color illustrations and real-world science, Vacation Guide to the Solar System is the must-have planning guide for the curious space adventurer, covering all of the essentials for your next voyage, how to get there, and what to do when you arrive. Perfect for fans of Neil deGrasse Tyson's Astrophysics for People in a Hurry, this tongue-in-cheek reference guide is an imaginative exploration into the “What if” of space travel, sharing fascinating facts about space, the planets in our solar system, and even some moons! Olivia Koski is Head of Operations at Guerilla Science. She was previously a senior producer at the Atavist Magazine, where she produced 30 interactive journalism stories, five of which were nominated for a National Magazine Award and one an Emmy. She has a masters in journalism from NYU, and her writing has appeared in Wired, Popular Mechanics, and Scientific American. Jana Grcevich, PhD, has worked as an astronomer and science educator at the American Museum of Natural History and hosts shows at the Hayden Planetarium. She received her undergraduate degrees in astronomy, physics, and mathematics at the University of Wisconsin-Madison, and her doctorate in astronomy at Columbia University. Her research interests include dwarf galaxies and interstellar gas, with a focus on radio observations and simulations of gas in dwarf galaxies. She teaches astronomy to future high school Earth Science teachers as a part of the Master of Arts in Teaching program at AMNH.